DC Universe Presents Vol. 3: Black Lightning and Blue Devil collects, as the name implies, the four-part story by Marc Andreyko, plus stories spotlighting Red Hood and the Outlaws's Arsenal and Starfire by Joe Keatinge and a Beowulf story (branching out of Sword of Sorcery) by Tony Bedard. I passed this one up earlier as there didn't seem to be much I needed to know about the title characters for their brief appearance in Justice League, and I snagged it now mainly for completeness as I tidy up after some New 52 books I missed the first time around. The concept of a Black Lightning/Blue Devil team-up seemed just oddball enough that I wondered if it could possibly succeed. These are two characters with long (and somewhat troubled) histories at DC Comics, and whose adventures I've enjoyed in the past (especially Blue Devil as the everyman in Shadowpact) but who've never really been associated with one another. That Marc Andreyko -- whose work on Manhunter I still hold in high esteem -- is present was another indication this might work out. To Andreyko's credit, Black and Blue is a perfectly passable superhero story that does not acquit either character badly. I understand there were some misgivings over the use of Black Lightning Jefferson Pierce in general, but he remains a dedicated school teacher who fights crime, whereas I believe initial reports suggested he'd no longer be a teacher. I liked the dynamic between Jeff and Blue Devil Dan Cassidy, now former school friends, with Dan as the cut-up but also the more violent of the two, and Jeff trying to bring restraint to the Devil's crime-fighting. Andreyko also blends Lightning and Devil's origins well, including Jeff's father, Tobias Whale, the demon Nebiros, and Dan's moviemaking; it's also an interesting change given Blue Devil's history that Dan can now change out of devil form, when it caused previous versions of the character so much angst to be stuck that way. At the same time, Andreyko makes no real convincing argument for why these two characters should be teamed besides the coincidence of their names. Though I do think Andreyko blended the classic elements of the characters' origins nicely, the incongruous shifts from high school to movie studio indicate where the combined stories don't quite mesh; their power sets don't really go together and Black Lightning isn't traditionally involved in the supernatural. Andreyko's story is a bit jumpy, too, even with four issues to tell it; it's not clear that Dan's confidant is his grandfather until after the man is killed, and for instance it just so happens to be Dan's godson who witnesses a person explode after a demon-affected drug overdose, but with no consequence or mention of the godson again. Joe Keatinge's Outlaws stories are both entertaining. Keatinge treats Arsenal as a goofball, but one who's eminently capable (something hinted at but not quite there in the issues of Outlaws I've read) and I liked this portrayal of Roy Harper as "weapons master." In the Starfire story, Keatinge cleverly manages to alter Koriand'r status quo very quickly and then tells a tale that challenges her warrior mentality perfectly in line with Marv Wolfman's early portrayals. The only detraction is that Starfire's story is revealed in the last pages to be related to Arsenal's in a way that's hard to understand, and it does not appear that Keatinge was able to follow up on that cliffhanger anywhere. I liked Tony Bedard's "Beowulf" back-up series when I read it in Sword of Sorcery, and this single issue (ostensibly the last part of the story) holds up equally well on its own. Bedard foiled traditional "swords and sorcery" tropes by setting "Beowulf" in the future, and specifically a very detailed New 52 future (take that, Futures End), which, along with art by Jesus Saiz, kept my attention throughout. The DC Universe Presents story, complementary but different, sees Beowulf transported to the New 52's present; Javier Pina's energetic, detailed artwork is equally good. My only complaint, the same as before, is that the issue's cover teases Beowulf meeting the Justice League, but this only turns out to be a shape-shifting enemy. Back in the 1990s, I recall the Showcase series as being a can't miss anthology, perhaps because with three stories per issue, something had to be good. DC Universe Presents Vol. 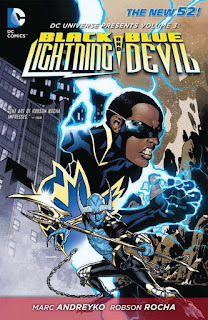 3: Black Lighting and Blue Devil contains multiple stories, of course, but obviously the stories didn't unfold as quickly, and there's been nothing in this series I necessarily couldn't have gone without. Maybe there's enough other books that there's just no role for an anthology at DC in the present, but then again I wonder about a double-sized "Rebirth" anthology, three stories, released twice a month? Perhaps that might work where I don't think DC Universe Presents did. Wait, so you own nearly everything from the New 52? Holy moly Batman!